I wanted a unique name that would describe the area where we live and our freedom of attitudes. 38 degrees is our distance north of the equator. If you look up "latitude" in the dictionary, you will find one of the definitions to be "freedom from normal restraints, limitations, or regulations." I guess I was a late bloomer. I didn't know who Jimmy Buffett was until I heard his songs performed by Steve Meyer on Catalina Island one night in 1984. I rushed out and bought several of his tapes, subscribed to the Coconut Telegraph, and began going to concerts—the first being at Concord Pavilion August 17, 1984. 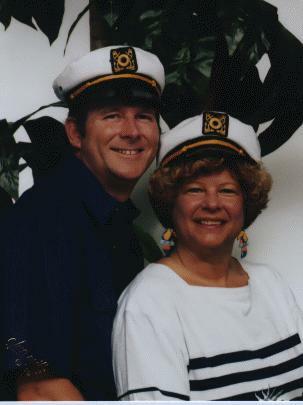 When I met my husband, Wayne, I immediately introduced him to Jimmy Buffett's music and he became a fan. I didn't discover Parrot Head Clubs until 1994 on the Internet. I immediately wrote to the National Founder of pArRoT hEaDs In PaRaDiSe, Scott Nickerson. I learned that as a Club, we would have to join and pay dues to the national organization, we would be expected to do community and environmental projects, have regular meetings, send a bi-monthly newsletter to all other national clubs, and of course, PARTY. I talked with my husband, Wayne, and together we decided to start a club in this area. We soon became the first northern California Chapter of pArRoT hEaDs In PaRaDiSe. It took a lot of work to get it going. First, I had to think of a name for the Club, choose our Club Colors, then join P.H.I.P. by sending in an application along with the yearly dues. Next I had to write up a newsletter, get the word out locally by word of mouth, mail, and over the Internet. We became known as Latitude 38 Parrot Head Club. We chose our Club colors of Teal, Purple and Deep Pink. We held our first meeting August 30 at El Torito in Dublin. I believe we had nine parrot heads show up and join our Club that evening. We have become much more organized with several elected officers, and volunteer Committee Chairpersons. We currently have close to 90 members in our organization. We work as hard as we play—and we enjoy it.